What People Say: Why Collect? Why collect anything at all? Below is a selection of edited replies. We would like to add more comments and digital photos of members plus their displays. From early 1998 into 2000 my wife and I lived in Camberley, south west of London. I was on a job assignment with my US based company. Early on my wife went shopping with friends and bought our first Hazle Ceramic - Teashop & Telephone. She hoped I liked it and it was her intent to just have that one. It would be a good reminder, when we returned to the USA, of the English red phone booths we liked so much. There was no intention of ‘starting a collection’. At first I didn't even know there were others. Well, I did like it. It was nicely hand painted, high quality and very displayable. I found out there were others, started acquiring more and learning all I could. I was quickly getting hooked - and the addicted part came soon after! My wife went to visit the stables, and was actually there on the day to witness the breaking of the Tom Morris mould. I went to several signings where Hazle Boyles came with special pieces, mainly at Harvey Weston’s in Cobham. It was always a wonderful excursion. I will never have enough because I want them all - but alas there is this income and budget thing in the way. We had a lovely time living in England, and these superb buildings serve as a constant reminder of those nice times. The ceramics are all beautiful and interesting in their own right. Being hand painted, rather than a clone mass production, is a BIG PLUS. That you can have them custom painted is enticing. Hazle Ceramics began as a labor of love and retains that attractive image even now. Hazle is at pains to point out that it isn't an "image"! Above, Hazle signs a newly launched St Giles Cafe for Clay at Harvey Weston in 1999. I've been collecting them since around 1990, when my teenage son was a baby... I fell in love with the Chocolate Shop and spent the housekeeping on it! I never intended it to grow, but my collection has taken over my kitchen wall, and every time I decide to stop, one more appears which I have to have! I love them all and they hold many memories from the time they were bought, and everyone who sees them thinks they are great. I live in terror of dropping one when I take then down from the wall for their bi-annual wash and brush up though! I have never been a great collector of anything. As a kid I collected stamps for a while as one does. I now have a collection of football programmes, kept as a record of matches I've attended. I am a bit of a statistics nerd and like to look back on past scores. Thus my small collection of Wisden almanacs - an annual digest of cricket matches across the globe and other interesting articles. Our Hazle Ceramics are always referred by visitors as they are a point of interest. They are well painted and look a quality item. But what really makes it for me is the subject matter. 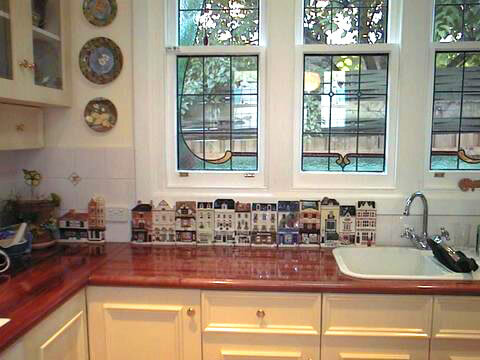 We do have a fantastic architectural heritage in the UK and the ceramics portray this beautifully. Having grown up in the 60s when we still had a dairy, Post Office, baker and two butchers - and the ubiquitous, uniform supermarkets were still few and far between - the ceramics remind me of a simpler age. You go to any High Street nowadays and you could be anywhere in the country with its shopping mall and pedestrianised sameness. You go to any European town or city and the outskirts are all the same - Garden Centres, DIY Stores and Hypermarkets. We have advanced technologically but often destroyed any sense of community. In my Hazle High Street there are no parking problems, traffic noise or air pollution and the pubs, cafes or shops only sell wholesome natural products! Perhaps this is a sort of virtual reality - my version of Martyn's "simpler age". I also grew up in a village and during my home birth, one of Clay's beloved red phone boxes was used to summon medical help. Visually charming but they are definitely more hygienic as a Hazle Ceramic! Early memories include the Baker delivering out-of-the-oven bread on a bicycle always to back doors - the trade entrance! And the village Cobbler, who worked from a large leather-scented garden shed, full of paraphernalia fascinating to a small child. The tiny Post Office sold everything just like Hazle's - how did people get all their day-to-day needs from so few small shops? I first discovered the ceramics at Tile and Pine while visiting Sidmouth, just three miles from my birthplace. This lovely Regency seaside town epitomises the essence of Hazle Ceramics with period architecture and individual shops, many in the same family for over 100 years. The place where Queen Victoria stayed as the baby Princess Drina is still there, as is the Victoria Cottage Hospital which is expanding. As a new member I can't tell you how nice it is to have fellow collectors. I thought I was the only one who went wobbly at the mention of Hazle Ceramics. I discovered them in 1991 at Covent Garden and was mesmerised. I must have stood there an hour just looking. I wish I had started collecting then, but alas couldn't justify it as I knew I would get the bug. I bought my first in 1997 and now have 40... I got the bug! There is just something about them that keeps my attention for ages. Luckily I don't live too far from the stables as my sister in law lives in Benfleet, Essex. We almost always go to Hazle's workshop when we visit her. I have to restrain myself from popping in as my husband always buys me a couple. He knows they make me happy. Here's another neophyte - in the USA! I'm a new kid on the block so far, having just started collecting about a year ago. 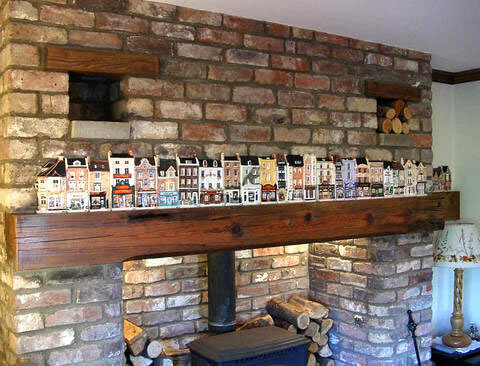 I happened on Hazle tiles in a gift shop in the Cotswolds last summer and fell so in love with them. Like another member (I forget who) I've lined them up along the back of my counter top. It's definitely a bad case I have in this Hazle epidemic : ) I was sad to have missed the Hazle signing in London (John English Gifts 2003) but it just didn't work out with our schedule. I was biting at the bit knowing I was in England that day but unable to be in London. I've enjoyed the reports immensely and I'm so glad to get a chance to meet other members online. All my pieces have significance, related to events in my life, or my love of certain things, like wine, food, theatre, children, cats, to name a few. My first purchase was the bookshop based on Heffers Childrens Bookshop, where I used to work a long time ago. I also worked as a pharmacist in Boots and so on! Thanks for the pricing link, it was interesting reading. If I could buy ceramics as and when I like my husband might have something to say about the bill! I am glad some of them are expensive as I love the thrill of receiving a coveted one for special occasions. I got the Royal Theatre Lion King for Mothers' Day. My husband had it in his 'stash' for a while, but this is something we went to see as a family for my birthday and the ceramic is a lovely memory. As I said before, all mine have some significant story or association. I am always surprised when I open the box. I wonder when I will get the Pawnbroker - that's where my wedding ring came from 23 years ago! I have added a photo album "Wall Display" to the Yahoo site that shows how I display the fifty-five Hazles I have collected. A friend did some wall painting around them. It has cheered up an otherwise boring hall. I don't remember how or where I first discovered Hazle, but I was in England at the time. I so love the pubs, so that is what I started with. When I started collecting again, I was also in England. I bought a Marks & Sparks for the friends with whom I was staying - and one for myself! When I got home, I got onto Hazle's website and eBay. My second strata of acquisitions were establishments that I knew: theatre, Filofax, Boots, and the like. Now I'm branching out to others. England, especially London and Bucks are really my home from home, so these pieces keep me happy here in the States until I can get back. Marilyn, if you are even more passionate after three years, I ask only one thing - will you visit me in the Poor House? I guess a Poor House piece would resonate with collectors? I know people sell older pieces to fund newer ones but I'm not at a point where I could give up anything. I fell in love with the UK from the beginning which must have been over 30 years ago! I adore nearly everything, although I found it a little hard to breathe when last in London. (I hope the latest efforts by the most interesting Mayor help that situation.) 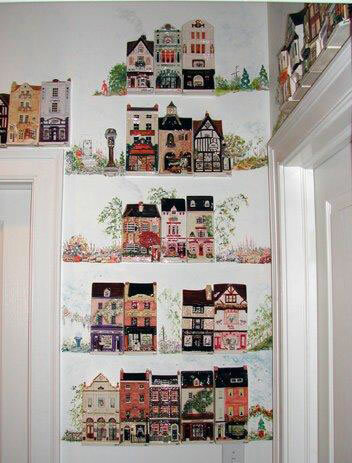 A very dear friend from university and her husband have spent most of their adult lives in England. I have been fortunate enough to stay with them, once for 18 months. I've not done a very good job of cruising the countryside. I always find something new to do in London. I do adore the Cotswolds (Chipping Campden being my favorite) and have visited the Lake District. Anyway, I am well and truly hooked on your country. I can even occasionally insult people without their knowing it, a talent the English have raised to a high art form and which amuses me greatly. I've been collecting Hazles for about 4/5 years and have about 80 pieces (not quite sure how many as they are still in the boxes and I can't find my list). I had a break of about 18 months because we were in the process of planning a move and then the reality of moving which included a stint in temporary accommodation!! As a result collectables, sentimentals and irreplaceables, went into storage. Unfortunately most of them are still in boxes but never mind, they are getting nearer the top. I discovered Hazles at Covent Garden about 4/5 years ago. My daughter saw them first, bought me one as a present and the rest, as they say, is history. I visited Len regularly, got very good service and enjoyed our chats. His guidance, especially in the early days of my collecting, was invaluable. I have managed to get a few Hazles from eBay but still get a thrill out of going to Covent Garden, sometimes John English and a few other outlets I know of. We don't go so often these days because we live twice the distance now and the train fare is so expensive - I could buy another ceramic! Buying/acquiring a new Hazle is a very serious affair, specially when you've bought two of something because you forgot you already had it - a senior moment I think. We are not too far from Hazle's new home so I expect I shall be a regular there again. In September 2005 there was discussion relating to Eric's talk at the 15th Anniversary. As a collector of several genres, Hazle's pieces are particularly special to me. As English architecture is regionally specific, I can look at my collection, and find myself immediately back in "jolly olde England". Married 5 years now to a London black cab driver (whom I met on the internet, believe it or not) we have spent a great deal of time there. My husband started over in the US for me, so I could tend to my elderly parents. In our "England" room, nothing gives a truer sense of "British" atmosphere than our Hazle's. We are suddenly back at my husband's mum's, or her high street. In the US individual shops are truly a thing of the past. Little shops have made way for huge shopping malls that all basically look the same. Butcher shops are truly a rarity, as well as fruit and vegetable shops. In addition to the terracing, I think this is another attribute that makes English shops and houses so unique. I would never collect something I didn't just love to begin with, but the history and background of Hazle's pieces just make them all the more lovable and interesting. With all our High Streets turning into cafe/bistro land and the rise of out of town malls with nothing but vast department stores and national chains of designer clothes, this range recalls a bygone age that is a precious part of our heritage. I know of no other ceramic maker who supplies such beautiful reminders of yesteryear. 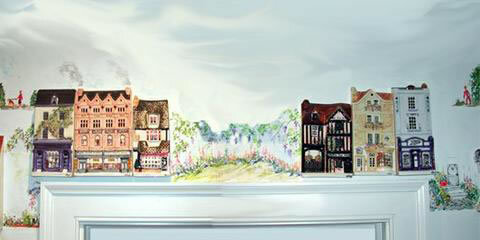 In October 2012 UK collectors Rose and Tom Warren emailed this picture of their ceramics set in a specially painted wall mural. The artist Gillian Jeffrey is based on the south coast near Southampton and would be happy to accept further commissions. Rose and Tom say she is professional, very accommodating of customers' wishes and reasonably priced. Her email address is workshops@gjworkshops.com.